I read this book whilst holidaying in Hawaii, a very appropriate setting. A ten hour Airbus flight that I found very uncomfortable was certainly put into perspective. However, if given the chance, guess how I would rather have travelled. McLynn's style may seem dry to some people. Everything is backed by several references and even the validity of those resources is discussed. What eventuated was one of the best history lessons. Being Australian the image I had of Captain Cook was manufactured from several years of government imposed dreary history lessons. If you had asked me a year ago about my knowledge of Captain Cook I would have said "That's the guy who discovered the east coast of Australia and brought out the First Fleet...Right?". Thanks Board of Education.Captain Cook was a one of the greatest surveyors in history and possibly one of it's greatest explorers. Although he did not discover Australia, he mapped the majority of the eastern coastline; he discovered many South Pacific islands, he ventured further into the Antarctic than anyone had before and anyone will for another century. He explored the Arctic looking for the Northwest Passage.What is also evident is Cook's liberal philosophies for his time. His treatment of native islanders was vastly nicer than what was the norm at the time, he even angered his crew with how well he treated the natives (well maybe on his first two voyages, not the third).This book is highly recommended to a reader who loves history or exploration. I'd even go further to get Australians to read it. Find out who the man was rather than the public school rote learned blandness. I had no idea that Captain Cook was the first man to sail into the Antarctic Circle. While very informative, and surprisingly detailed, the book has the feeling of a graduate thesis at times, due to the constant references to other author's works. The constant references also lend an aura of authenticity to the book as well, since he frequently quotes Captain Cook's as well as other officer's journals that were maintained during the 3 major voyages. A tremendous amount of detail on Cook's life. Some of the most fascinating is his behavior and thoughts around Polynesian people that he visited on many occasions in the South Pacific and Hawaii. 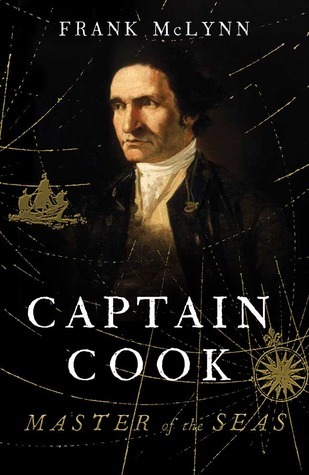 This seems to me to be very well researched, and it tries to look at the character of Captain Cook from all points of view, neither depicting him as the great discoverer nor as a monster, but as a person with virtues and failings. I found it somewhat overwritten though, and there were quite a number of typos. So, James Cook might be one of my heroes, but I'm not so sure about this book. This book goes beyond his journals to put his journeys into historical context, but there are some inconsistencies and errors that I find a little too distracting. Excellent history of the great explorer and his travel from England to the Pacific, Arctic and beyond. Frank McLynn - Frank McLynn is a British author, biographer, historian and journalist. He is noted for critically acclaimed biographies of Napoleon Bonaparte, Robert Louis Stevenson, Carl Jung, Richard Francis Burton and Henry Morton Stanley.McLynn was educated at Wadham College, Oxford and the University of London. He was Alistair Horne Research Fellow at St Antony's College, Oxford (1987–88) and was visiting professor in the Department of Literature at the University of Strathclyde (1996–2001) and professorial fellow at Goldsmiths College London (2000–2002) before becoming a full-time writer.